This infographic, created by Fair Use Week 2019, shares how fair use helps in saving software. ACRL’s Scholarly Communication Toolkit, developed and maintained by the ACRL Research and Scholarly Environment Committee (ReSEC), provides content and context on a broad range of scholarly communications topics and offers resources and tools for the practitioner. The Toolkit is freely available online and licensed through Creative Commons. 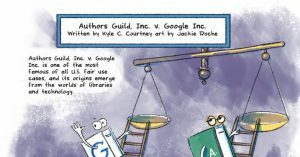 Fair Use Comic: Authors Guild, Inc. v. Google Inc.
Harvard University’s Fair Use Comic on the Authors Guild, Inc. v. Google Inc. case, written by Kyle C. Courtney, art by Jackie Roche. MIT’s Fair Use Kaleidocycle. Fold your own from this printable. This infographic illustrates how fair use advances innovation, creativity, and scholarship, ultimately allowing new knowledge to be created and shared. The comics on this page were created for the Harvard Library Office of Scholarly Communication’s Fair Use Week annual programs, 2015–2018. The newest comic for the 5th Anniversary of Fair Use Week (2018) will be added soon! Stay tuned!